O.C. History Roundup: Beans, Glenn Martin, Fullerton Fire Dept, etc. Today's image is by noted photographer Dorothea Lange, showing the cultivation of beans near Santa Ana in May 1937. 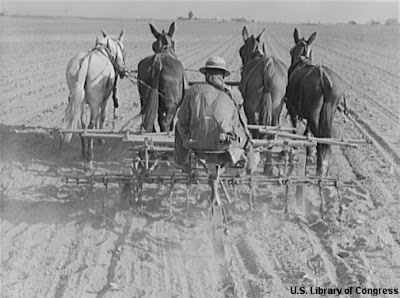 The mules are pulling a four-row cultivator. Tomorrow (Saturday) will be the 96th anniversary of the first water-to-water airplane flight. Santa Ana's Glenn L. Martin accomlished this on May 10, 1912, taking off from the waters of Newport Beach and landing in Avalon Bay at Catalina. Tomorrow with also mark the 100th anniversary of the Fullerton Fire Department. They will celebrate with an open house, 10am-2pm, at 312 E. Commonweath Ave, including firefighting demonstrations and tours of their headquarters. I posted a bunch of photos in the O.C. History group on Flickr today. I posted all the old pier photos for a writer at Coast Magazine, who needed them for an article. Other photos I posted incude shots from last night's Orange County Historical Society meeting, and from the ongoing restoration work on the historic Howe-Waffle House in Santa Ana. I thought I'd figured out how to post videos here, but I'm told some people still see black squares where the videos should be. I'm not sure what the problem is, but if you're experiencing technical difficulties with these movies (like the ones I posted Wednesday), please leave a comment or send me an email and let me know. Also, I will not be giving up on my traditional photo posts in favor of video. I'd just like to mix things up from time to time. You mentioned the Howe-Waffle House again, when I first read about it my first thought was that it was a Santa Ana restaurant that served waffles. Phil Brigandi has often joked about our breakfast-themed historic homes in O.C., like the Waffle House, the Bacon House and the Kellogg House.